Chu liu bai chai is a simple vegetarian dish, a well known Lu Chai 鲁菜 from Shandong 山東 region where it is famous for the production of good quality vinegar. 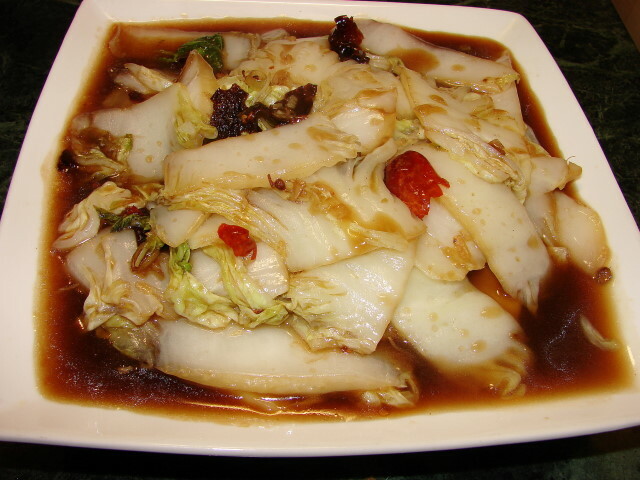 This stir fried Chinese leaf or napa cabbage main flavour is the vinegar to give it a sharp taste. The vegetable is stir fried briefly to keep it crunchy. Boil a pot of water, when boiling blanch Chinese leaf for about 1 - 2 min. Remove and drain. While the vegetable is still hot, heat oil and fry the Sichuan peppercorns, when oil is fragrant remove peppercorns. Then fry the dried chillies till brown. Add ginger, garlic and spring onion, stir fry briefly. Add blanched vegetable stir till heated through. Add sauce stir till sauce has thicken. Done. There is not a lot of sauce at this point, but after transferring to a plate more vegetable juice will seep out to make the sauce. Oooh - this sounds like the home style cabbage I love so much at silk road in camberwell. Will definitely be trying it.